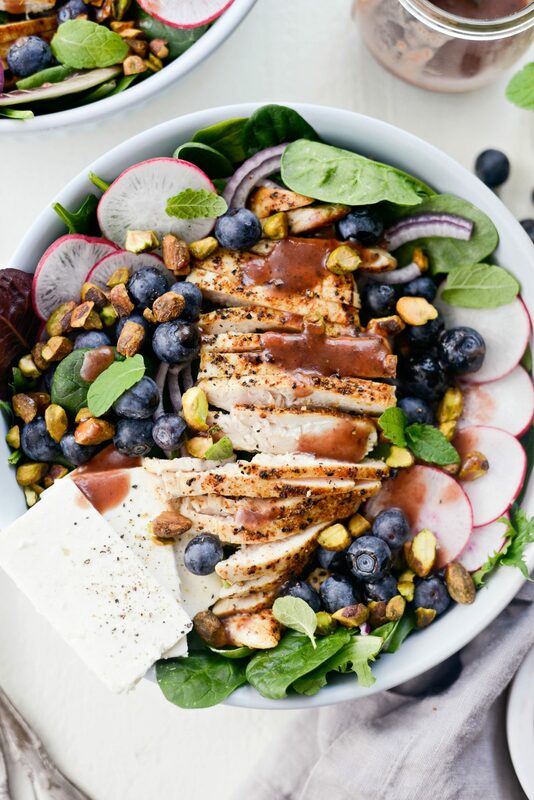 This beautiful Chicken Blueberry Feta Salad has fresh blueberries, pistachios and feta is topped with chicken and drizzled with a super simple Pomegranate jam vinaigrette. 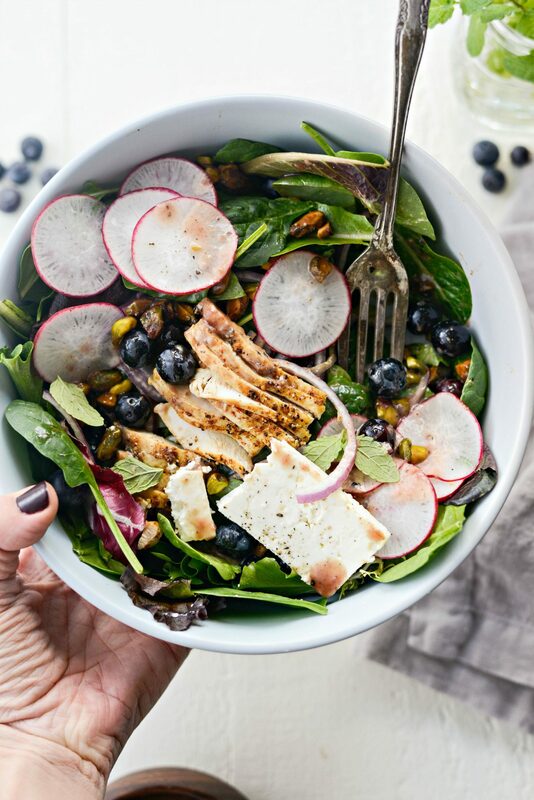 The perfect spring salad bursting with flavor and delicious texture. I’m so happy to finally see signs of spring. The ice on the lake and snow and the has melted (and then came back and then melted again) and the temperatures are starting to warm up a bit. We’ve also started to hear the little spring peepers which is a sure tale tell sign spring is here. With the arrival of spring, comes my love for salads. Just kidding, I always love salads. 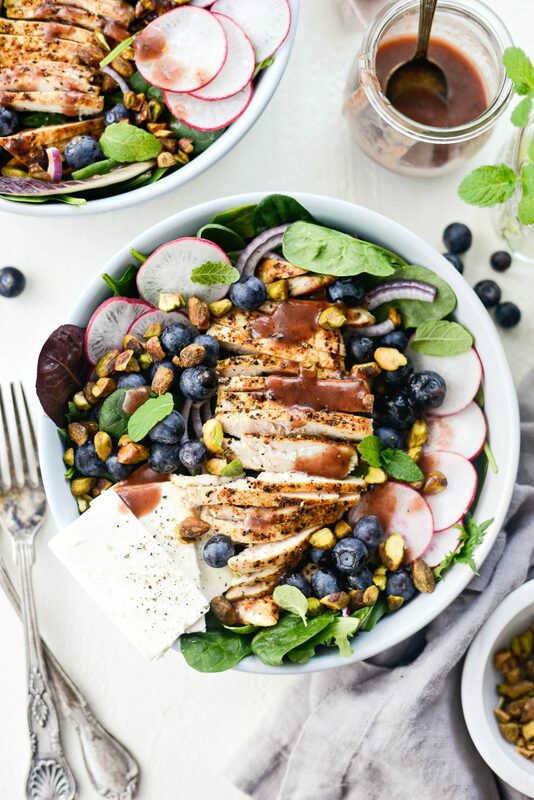 I love salads SO much that have a backlog of new recipes, with amazing flavor and texture combinations that I had to start sharing starting back in January! 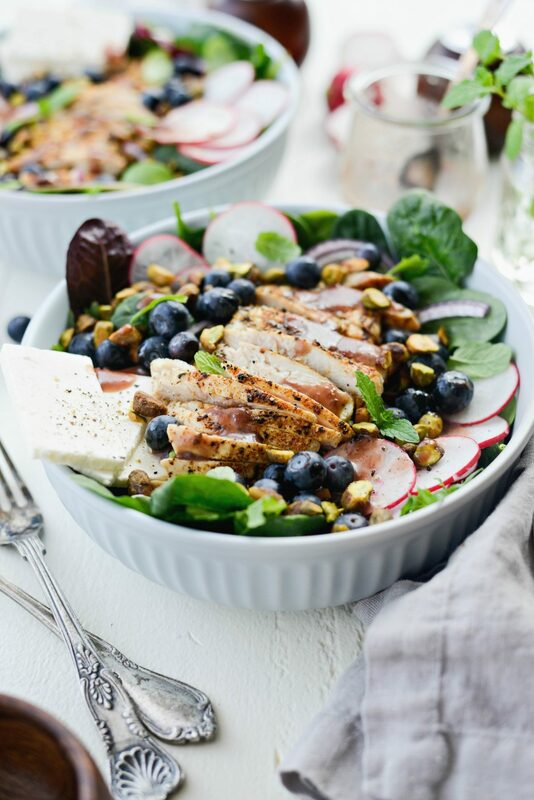 The first one for spring is this chicken feta and blueberry salad. 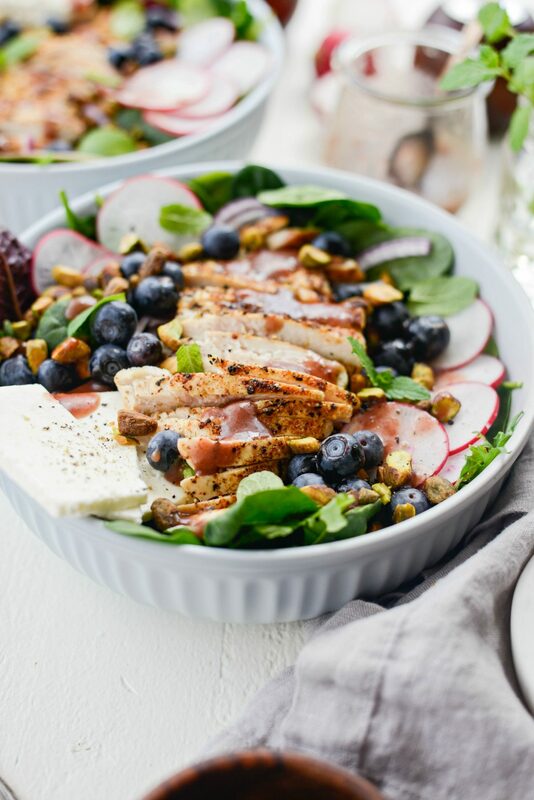 Pretty similar to this but with the addition of more toppings like radish, mint, sliced chicken and the most delicious jam vinaigrette everrr. Happy spring my friends! 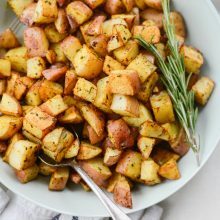 I hope you enjoy this delicious spring salad. I love using jam in vinaigrettes. 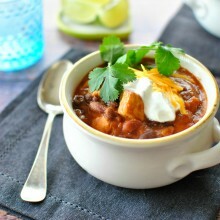 It adds the perfect sweetness and the end result has a luscious consistency. 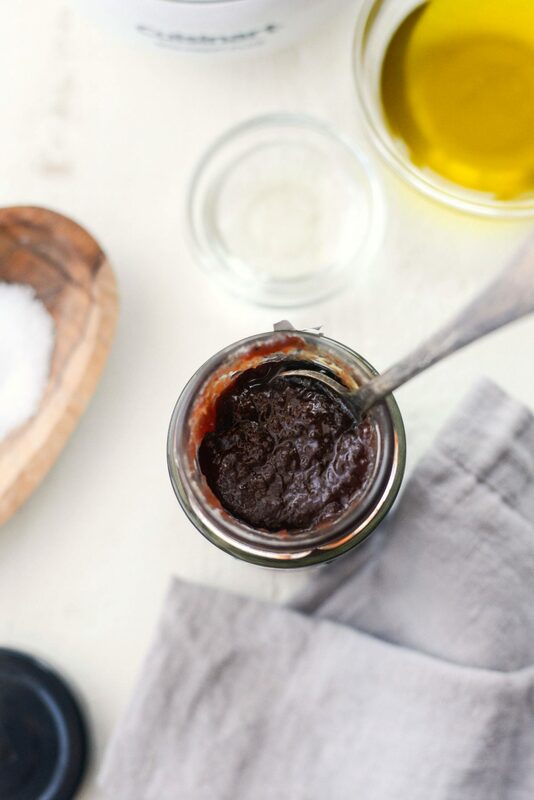 First, in the bowl of your mini food processor or in a bowl using a whisk, combine 2 tablespoons pomegranate jam, 1 tablespoon champagne vinegar, 3 tablespoons extra virgin olive oil and pinch or two of kosher salt and a few turns of freshly ground black pepper. 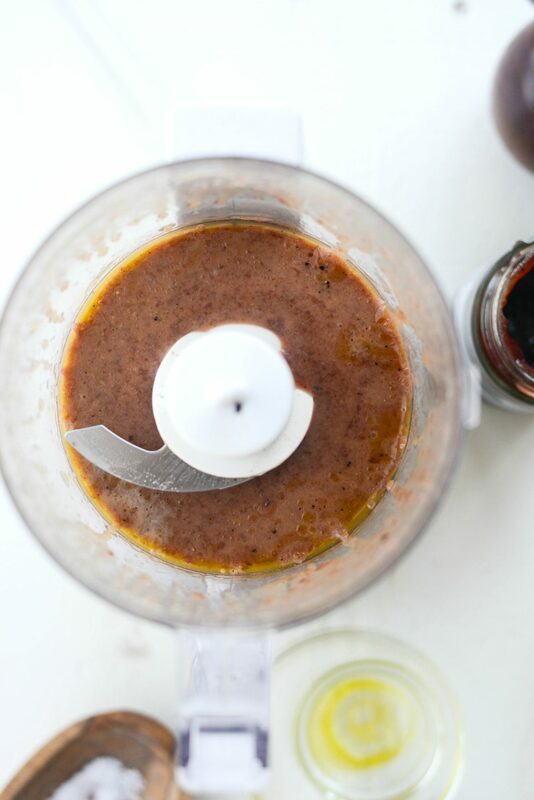 Turn your food processor or whisk until thoroughly combined. 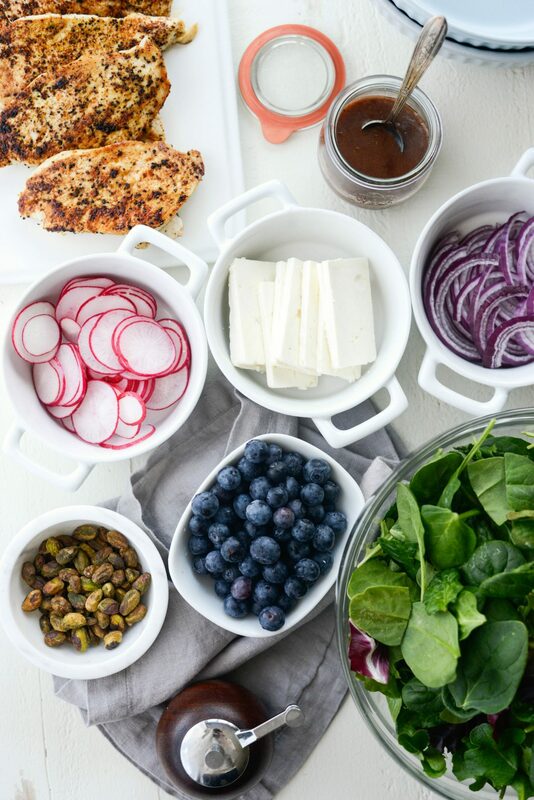 Next, for the salad, you will need; 5 ounces spring mix or spinach blend, 1/2 a small red onion – thinly sliced, 1 cup (I just eyeball it) fresh blueberries, feta – crumbled or sliced from a brick, roasted and lightly salted shelled pistachios, 4 to 6 radishes – thinly sliced, fresh mint leaves and cooked chicken. Then, for the chicken, slice 2 to 3 chicken breasts in half horizontally. Next, season with lemon pepper and paprika. Then spray a skillet with olive oil and cook the chicken for about 6 minutes a side (depending on thickness) until fully cooked and no longer pink. Allow the chicken to rest for 5 minutes under foil, before slicing. Lastly, divide the salad greens among bowls. 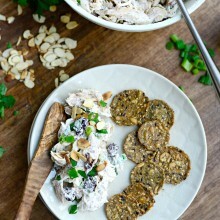 Then add the sliced chicken breast, blueberries, radish, onion, pistachios, mint and feta. 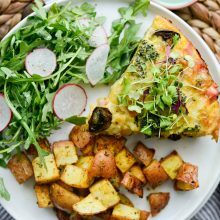 Fresh and light and healthy. My kind of salad! 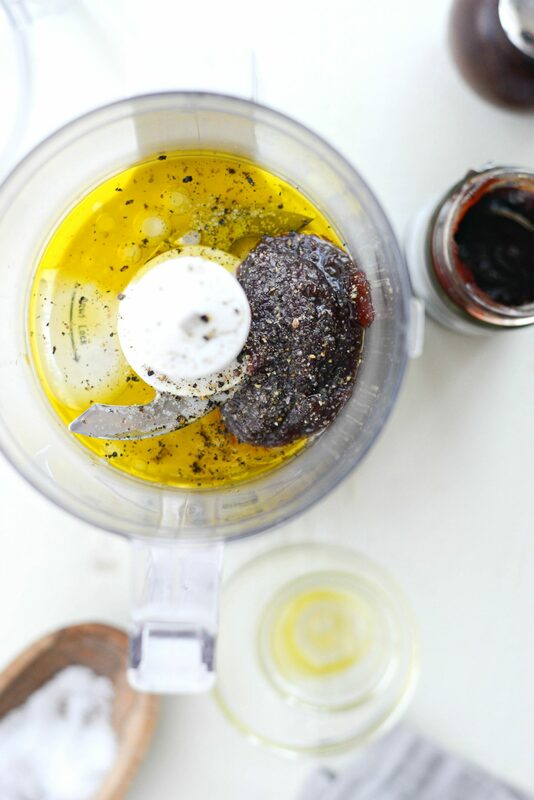 In the bowl of your mini food processor or in a bowl using a whisk, combine 2 tablespoons pomegranate jam, 1 tablespoon champagne vinegar, 3 tablespoons extra virgin olive oil and pinch or two of kosher salt and a few turns of freshly ground black pepper. 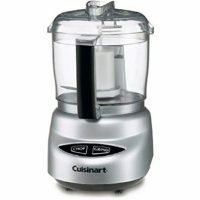 Turn your food processor or whisk until thoroughly combined. 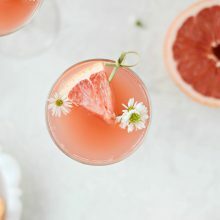 Pour into a small jar or bowl and set off to the side. 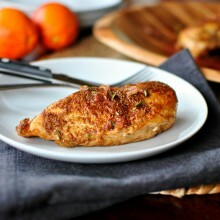 Season the chicken breast halves with lemon pepper and paprika. Meanwhile spray a large 12-inch skillet with olive oil and preheat on meidum-high heat. Once hot, work in batches cooking the chicken for about 6 minutes a side or until the middle is no longer pink and fully cooked. 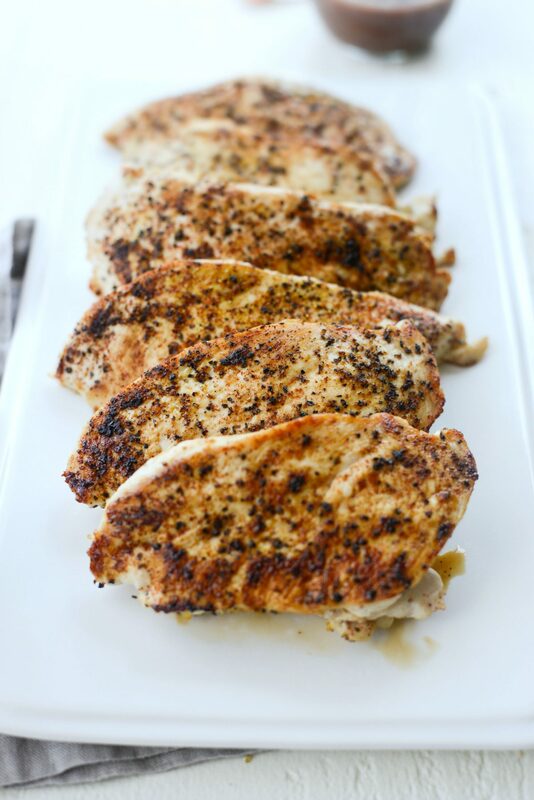 Transfer to a cutting board and repeat with remaining chicken. Allow the chicken to rest under foil for 5 minutes before slicing. Replace the foil to keep warm. 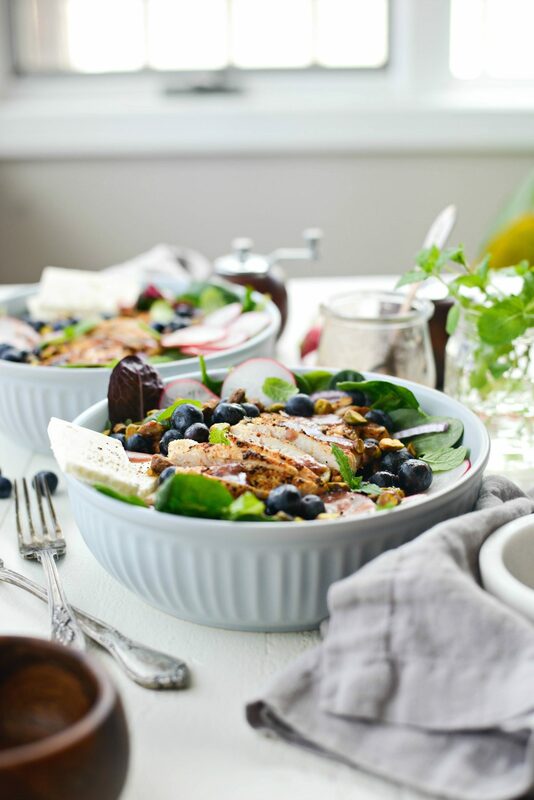 Divide the salad mix among bowls. 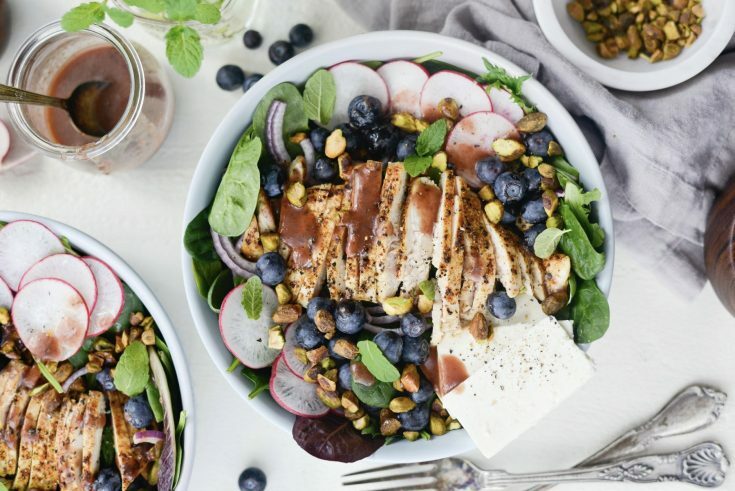 Top with the chicken breast, blueberries, radish, onion, pistachios, mint and feta. 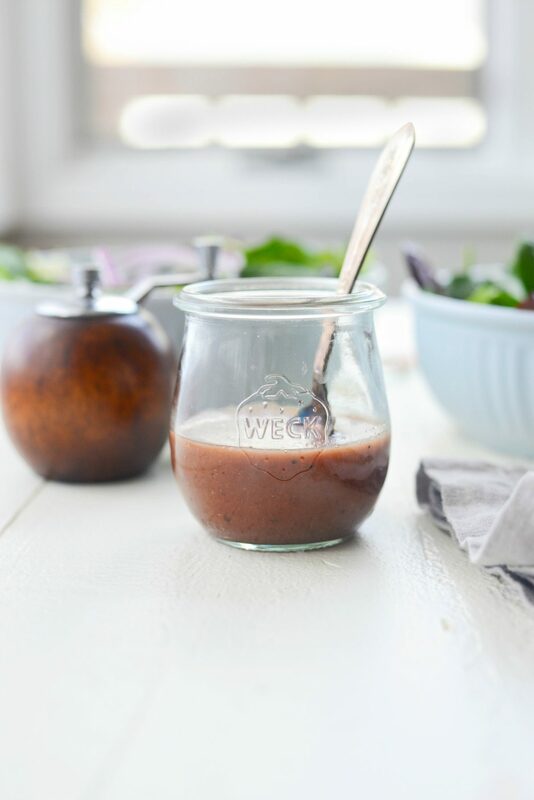 Drizzle each salad with a few spoonfuls of the jam vinaigrette and scatter a few mint leaves. Note: this is a small batch dressing. 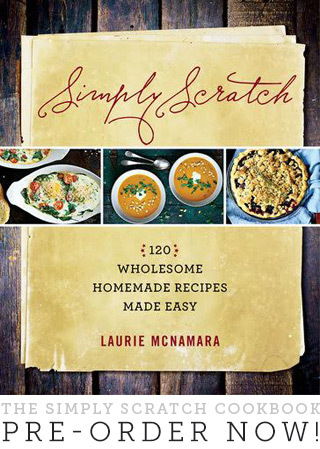 Perfect for 4 salads using a couple spoonfuls per serving. Therefore consider doubling if wanting a more dressing heavy salad.